The FAA just announced their new registration requirements for UAS (unmanned aerial systems), and everyone is talking about it. The drone press is generally focused on getting the word out to hobbyists. AMA members are rightfully upset. Several groups take issue with the $5 registration fee, and others question the legality of the process the FAA has used by essentially skirting the public comment period due to last minute concerns over holiday drone sales (I mean, who knew Christmas was coming, right?). With all that being said, we here at PRENAV can’t wait for the new registration process to replace the current N-number process (expected to be extended to commercial UAS by Mar 31, 2016). Today’s registration process for commercial drones is slow and cumbersome, and not cut out for the rapid pace of technology development in the industry. The new process sounds considerably streamlined, although I still need to see what specifically they will require of commercial systems. Since not everyone is familiar with the current aircraft registration process, here are some of the steps we recently went through to register some of our prototype UAS systems. Consider this the unofficial guide to getting your commercial UAS system registered today. First, we had to apply for an “N-number” for each of our drones. N-numbers are used to identify all types of aircraft that are operating in the national airspace. There’s an online process where we could apply for our N-numbers. Cost is $10 per number. Once we made some selections and submitted payment, it took a few weeks before we received a letter in the mail granting our N-numbers. San Diego Gas & Electric FAA-registered drones stamped with the N-number "N544L". Photo source here. 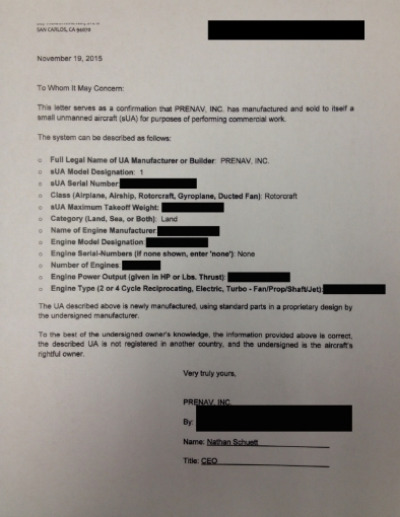 Then, we needed to register that particular make/model of aircraft to its N-Number and file that with the FAA. To our surprise, the forms were not available online; we instead had to call our local FAA office and wait for them to mail us hardcopies. Also, it's important to be careful when filling out the forms since the FAA won't accept forms with cross-outs or whiteout on them. That also means that if you make a few mistakes, you have to request new forms to fill out and wait again. 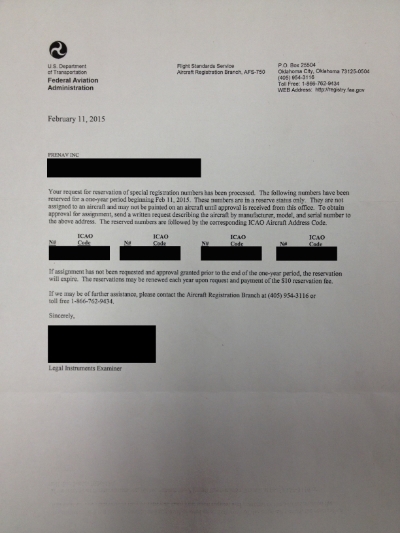 As we were filling the form out, we realized that we also needed to provide the FAA with a “proof of sale” including the specs of the aircraft. Since we’re a manufacturer of drones who hasn’t started selling our product yet, this was a bit tricky. We found a workaround, which was basically a letter that we needed to write to ourselves, and another form to fill out (thankfully we could download this one online, but it needed to be notarized...). We mailed that all back to the FAA, and now we’re waiting to get a response to see if we did it right. The entire process took several months, so you can see why I’m pushing for the new process to be rolled out to commercial UAS quickly. We'll take a simple online registration process and unique identifier over the N-number process any day. I also think it's important to increase awareness and accountability among new drone users, so overall I'm in favor of the new registration process.